Inclusive education is about ensuring access to quality education for all students by effectively meeting their diverse needs in a way that is responsive, accepting, respectful and supportive. Students participate in the education program in a common learning environment with support to diminish and remove barriers and obstacles that may lead to exclusion. Inclusive education is carried out in a common learning environment; that is, an educational setting where students from different backgrounds and with different abilities learn together in an inclusive environment. Common learning environments are used for the majority of the students’ regular instruction hours and may include classrooms, libraries, gym, performance theatres, music rooms, cafeterias, playgrounds and the local community. A common learning environment is not a place where students with intellectual disabilities or other special needs learn in isolation from their peers. Are responsive to individual learning needs by providing sufficient levels of support and applying student-centred teaching practices and principles. 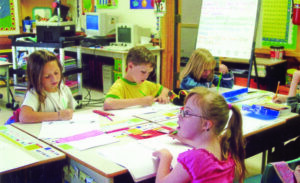 Common learning environment: an inclusive environment where instruction is designed to be delivered to students of mixed ability and with their peer group in the community school, while being responsive to their individual needs as a learner, and used for the majority of the students’ regular instruction hours.